The apostle Paul contends that an event in history is the foundation of the Christian faith. Not the teachings of Jesus, not the miracles, not anything else. If that event is not real, Christianity is empty, and Christians are of all people the most miserable – or to be the most pitied for believing something that is just a hoax. That event: The Resurrection of Jesus Christ. Either it really happened, and Jesus really did do what no other person has been able to do, and defeat death, or countless millions for the last 2000 years of human history – people who have shaped governments, led nations, been at the forefront of scientific discovery, championed education, fought slavery, upheld moral law, and been martyred for their belief – all these people must have been wrong! Either Jesus is who He said He was, God manifest in the flesh, or he was delusional Jew. As C.S. Lewis put it: “I am trying here to prevent anyone saying the really foolish thing that people often say about Him: ‘I’m ready to accept Jesus as a great moral teacher, but I don’t accept His claims to be God.’ That is the one thing we must not say. A man who was merely a man and said the sort of things that Jesus said would not be a great moral teacher. He would either be a lunatic – on a level with the man who says he is a poached egg – or else he would be the Devil of Hell. You must make your choice. Either this man was, and is, the Son of God: or else a madman or something worse”. 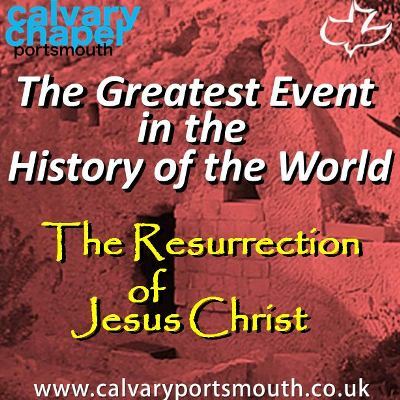 In this teaching, given in the heart of the New Forest, Hampshire, (UK), pastor Barry draws on many years of in-depth study into ‘Passion Week’ and the solid historical evidence that testifies to the fact that Jesus Christ really did rise from the dead. May you be blessed, encouraged and challenged by this study. Available to listen on line here, or as an audio download. Full PDF PowerPoint slides/notes of this teaching can also be downloaded free of charge here that accompany the audio teaching.